Family chocolatier Marimba have made a giant Easter egg to celebrate the opening of their new development kitchen in Sudbury, Suffolk. Mother and daughter team Jackie and Katherine crafted the 10 kilogram handmade egg using 43% single origin Venezuelan chocolate, the same chocolate as Marimba’s delicious hot chocolate Melt drinks. “We wanted to mark the opening of our development kitchen with something unusual and different. The kitchen is within the country’s only hot chocolate museum and enables us to continue to innovate without any disruption to our busy production kitchen in Bury St Edmunds” says Jackie. 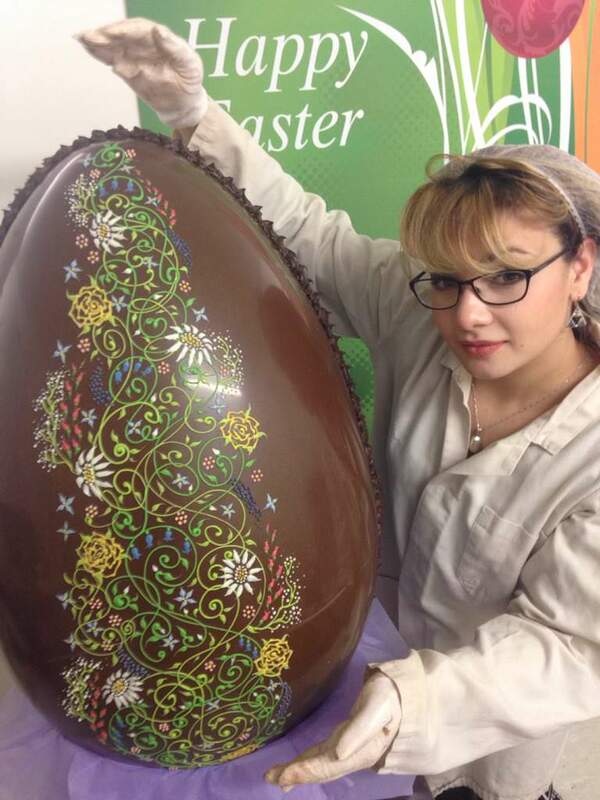 After the egg was created, resident chocolate artist Feriyalle spent hours painstakingly hand decorating beautiful patterns onto the egg. “The development kitchen is an important addition to our capabilities as a chocolatier” adds Brad Wright, Marimba’s sales manager. “Through 2017 we saw our fifth consecutive year of growth with our hot chocolate Melts being served in almost 600 cafes nationwide. The new kitchen will enable us to continue to release new and interesting retail products to support hot chocolate Melt sales throughout 2018”. Marimba World Chocolate are the producers of single origin hot chocolate flakes, available in 31% Dominican Republic white, 43% Venezuela milk, 71% Ecuador dark and 55% sugar free varieties. Flakes of real chocolate steam quickly and easily into milk or dairy alternatives for the ultimate luxury hot chocolate.